Shawn Young, Devonte Cafferkey and Sammy Farah appear on This Morning on Oct. 4, 2017. 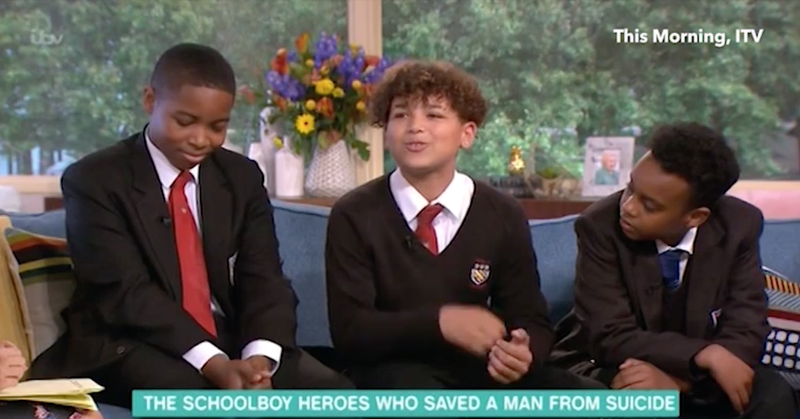 Three black British schoolboys will soon receive a national service award for their role in helping save the life of a man who tried to kill himself by jumping off a bridge in Waltham Cross, England, last year. As the Hertfordshire Mercury reports, Devonte Cafferkey, 13, and Sammy Farah, 14, spotted a man sitting with a rope around his neck on the edge of an overpass on Sept. 21, 2017. According to the paper, Devonte and Sammy rushed to grab him and tried to keep the man back so he wouldn’t jump. Meanwhile, their friend, 12-year-old Shawn Young, called for help. The boys held on to the man and tried to talk him out of jumping until help arrived in the form of Joanne Stammers, who heard Shawn’s calls. She took over for the boys, holding on to the man “for what feels like forever” until authorities arrived to take the man to the hospital. “The boys relaxed when I took over, but they were distraught, I kept thinking they need counseling because they had somebody’s life in their hands, and if they let go he would have died,” Stammer told the Mercury. Shawn’s mother, Carol, believes that the boys were meant to be on the bridge that day. She also told the Mercury that as the boys were holding on to the man, he began passing out, making it harder for them to manage his weight and hold him back. The boys, Stammer and one additional man, James Higlett, have all been credited with saving the man’s life and will receive a national award from the Royal Humane Society, a charity that promotes lifesaving intervention. A date for the awards presentation has yet to be announced.